His Excellency Dear Leader Hussein Pbama just can't control his bloodlust, can he? CNN: Two Afghanistan police officers killed by friendly-fire. Monsters And Critics: Villagers near Kabul claim four other civilians killed. Antiwar.com: 61 Iraqis killed, 84 wounded, 1 U.S. Contractor killed. The Australian: In Pakistan three bombings killed 15 people. Eight police officers shot dead by Taliban militants. Do you remember in during the years 2004, 2005, 2006, 2007 and 2008 all cries and gnashing of teeth from The Liberals to "end the war now?" Remember how The Left held the Bush Administration accountable for every single death in Iraq, Afghanistan, Pakistan, the U.S. and just about anywhere else? We sure don't hear much "end the war now" from The Left since January 20, do we? 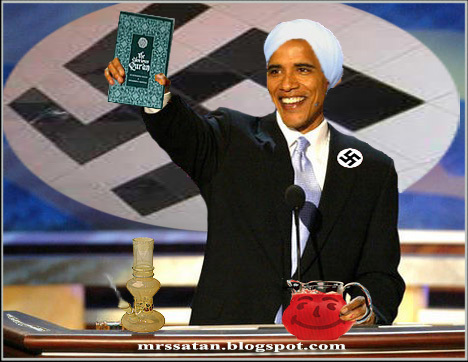 Hail The Antichrist The Stealth Muslim Prednint Born In Kenya! Obama said in an interview with The New York Times newspaper published on its website on Saturday that some of the recent U.S. success in Iraq involved reaching out to moderate Islamists who had been alienated by al Qaeda's indiscriminate violence. "Yesterday, Mr. Obama accepted and approved the path of peace and talks with those Afghan Taliban who he called moderates," Karzai said during a function in Kabul to mark International Women's Day. It sounds like Barry wants to pacify and appease terrorists. I told 'you so, I've been writing that he is (all Liberals and Progressives are) a Pacifist and an Appeaser. Pbama continues appeasing and pacifistic overtures to Iran and Syria while he tinkles on our ally The U.K. - see Classless Pbamas and Classless Barry. And we have the Secretary Of Chicanery Hillary "MrsSatan" Clinton not exactly amusing the Russians with her gift and gaffe. Who - which country - which Allie - will the Corrupt Fascist Pbama Administration insult next? Isn't Hope 'n Change promising, uplifting and motivating? The deaths, bloodshed, maiming and carnage is all owned by Pbama and has been since January 20. So is the next domestic terrorist attack on the U.S.
"War is Never the answer! NEVER!" "How many more innocent civilians will Pbama kill?"